This page describes how to set up your development environment to build and deploy your backend API using Cloud Endpoints Frameworks for the App Engine standard environment. This page uses the Endpoints Frameworks version 2.0 skeleton code sample to explain the basic software and components you need to get started. You might want to use the endpoints-skeleton-archetype or the hello-endpoints-archetype described in Using Apache Maven and the App Engine plugin (Cloud SDK-based) to create a new Endpoints Frameworks version 2.0 project. To get a better understanding of the steps required to deploy a sample API using Endpoints Frameworks, see the tutorial Getting started with Endpoints Frameworks on App Engine. Make a note of the Google Cloud Platform (GCP) project ID because it is needed later. If you don't have Java 8 installed, download the Java Development Kit (JDK) from Oracle's site and install it. Install and configure Maven for your local development environment. Download and initialize the Cloud SDK. Replace YOUR_PROJECT_ID with your GCP project ID. If you have other GCP projects, and you want to use gcloud to manage them, see Managing Cloud SDK configurations. Select the region where you want to create your App Engine application. See App Engine locations for a list of regions. Create an App Engine application. Replace YOUR_PROJECT_ID with your GCP project ID and YOUR_REGION with the region that you want the App Engine application created in. The Endpoints Frameworks version 2.0 skeleton sample contains the necessary build scripts for Maven and Gradle. It also contains the required files to get started creating your first API. MyApi.java contains an empty class that you can use to get started writing your API. See the echo example for sample code to help you get started. web.xml is a standard file that is used to configure a servlet. appengine-web.xml defines information that is required to deploy the API to the App Engine standard environment by using Java 8.
pom.xml contains project and configuration information used by Maven to build the project and deploy the API to App Engine. build.gradle contains project and configuration information used by Gradle to build the project and deploy the API to App Engine. 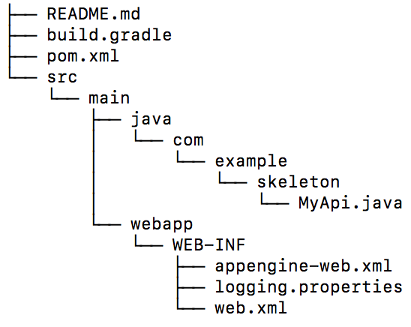 This section describes the Maven pom.xml and Gradle build.gradle files included in the sample code. Except for entering your GCP project ID so that it can be used in the hostname, the build files are ready for you to get started creating your API. This section describes the minimum configuration needed in your build file. The endpoints-framework dependency contains the necessary classes for creating your API. You need the App Engine Standard API SDK (appengine-api-sdk) to deploy your project to the App Engine standard environment. The standard javax.servlet package is required to build a servlet. The standard javax.inject package is required to support dependency injection. The maven-war-plugin extends the java plugin to add support for assembling a web application. The appengine-maven-plugin is required to run the API on App Engine. The endpoints-framework-maven-plugin provides tasks and configurations to build Endpoints Frameworks projects. The Endpoints Frameworks Gradle plugin is used to generate an OpenAPI document and to generate client libraries. You need the App Engine Gradle plugin to deploy your project to App Engine. The java plugin adds Java-specific compilation and build steps to your project. The war plugin extends the java plugin to add support for assembling a web application. The endpoints-framework-server plugin provides server-side support to the Endpoints Frameworks Gradle plugin. The appengine plugin is required to run the API on App Engine. The App Engine Standard API SDK (appengine-api-sdk) is needed to deploy your project to the App Engine standard environment. Endpoints Frameworks uses DNS-compatible names to uniquely identify services. Because GCP project IDs are guaranteed to be globally unique, you should use your GCP project ID as part of your API's service name. When you deploy the API to App Engine, a DNS entry with a name in the format YOUR_PROJECT_ID.appspot.com is created automatically. The hostname is both the name of the Cloud Endpoints service and the domain name that you use to send requests to your API. In the hostname field, replace YOUR_PROJECT_ID with your GCP project ID. The Endpoints servlet handles incoming requests and forwards them to the backend service running on App Engine. The Endpoints servlet is required for your API to be managed by Endpoints. For more information about web.xml, see The deployment descriptor: web.xml. The appengine-web.xml file is used to define the App Engine standard environment configuration when the API is deployed. See appengine-web.xml reference for more information. Write and annotate your backend API code. Deploy and test your API. Learn more about supported parameter and return types.